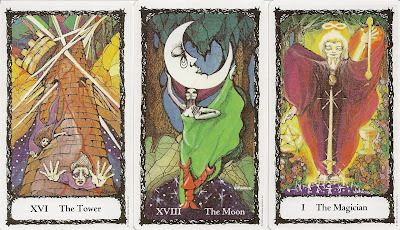 The Sacred Rose Tarot was originally published 1980 as a limited edition of 1000 signed and numbered majors-only deck and later expanded to a full 78 cards. The artist drew inspiration for this deck from Byzantine icons and medieval stained glass windows. Most cards show a prominent figure facing forward in a lush, natural setting. The backs have a white border, followed by a dark border. 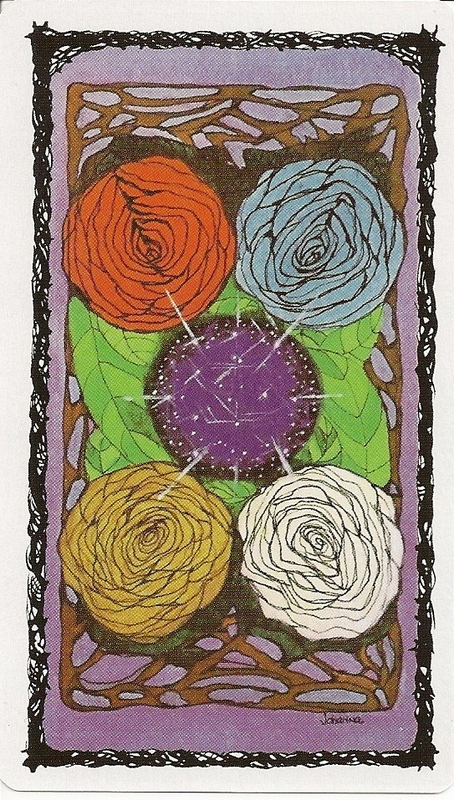 The center of the card shows five roses. The center, purple rose is the Cosmic Rose, suggesting time and space. The Red Rose stands for sacrifice, the White Rose represents purity, the Blue Rose represents the impossible, and the Gold Rose represents absolute achievement. The background on the cards is color coded: purple for Swords, Red for Wands, blue/white for Cups and orange/brown for Pentacles. The Red Rose is associated with the suit of Wands, the White Rose with the suit of Cups, the Blue Rose with the suit of Swords, and the Gold Rose with the suit of Pentacles. The number, in Roman numerals, and the card title for the Major Arcana and the number or title, along with the suit name for the Minor Arcana, appear at the bottom of the card .